The United States says North Korea is illegally smuggling refined petroleum products into the country beyond the quota of 500,000 barrels per year allowed under UN sanctions. U.S. documents sent to the UN Security Council committee monitoring sanctions against North Korea and obtained by The Associated Press Thursday cite 89 instances between Jan. 1 and May 30 in which North Korean tankers likely delivered refined products "illicitly procured" via ship-to-ship transfers. The documents say that even if each tanker delivered only one-third of its listed capacity the total volume would be above the 500,000 barrel annual quota. If loaded at around 90 percent, the U.S. said the tankers would have delivered nearly 1.4 million barrels of refined products to North Korea, almost triple the quota. The United States asked the committee to urgently inform all UN member states and the general public that North Korea has breached the quota. It also asked the committee to call on all UN member states to exercise "enhanced vigilance" against North Korea's attempts to obtain refined petroleum products, and to prevent ship-to-ship transfers. These ship-to-ship transfers "in our view represent the most urgent area in need of more vigorous UN member state implementation," the United States said. The U.S. said China and Russia have reported to the sanctions committee that they have continued to sell refined petroleum products to the Democratic People's Republic of Korea, the country's official name. "These sales and any other transfer must immediately stop since the United States believes the DPRK has breached the... refined petroleum products quota for 2018," the United States said. The documents list the names of the North Korean ships, their arrival date at ports in the country and their dead weight tonnage and estimates of the amount of refined petroleum products delivered if one-third, half or 90 percent full. 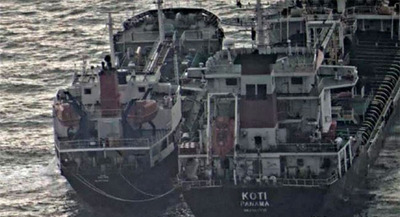 The U.S. also provided photos showing four tankers at Nampo port and noted that it previously publicized photos of eight instances where the DPRK used ship-to-ship transfers "to illicitly procure refined petroleum products." The quota on refined petroleum products was one of the tough sanctions imposed by the Security Council last December in response to North Korea's launch of a ballistic missile that Pyongyang said is capable of reaching anywhere on the U.S. mainland. Experts say years of increasingly tougher UN sanctions are having an impact on North Korea. At the historic summit between U.S. President Donald Trump and North Korean leader Kim Jong-un in June, Kim agreed to denuclearization. But the Trump administration has said sanctions will remain in place until that process is completed and verified -- and it hasn't even begun.